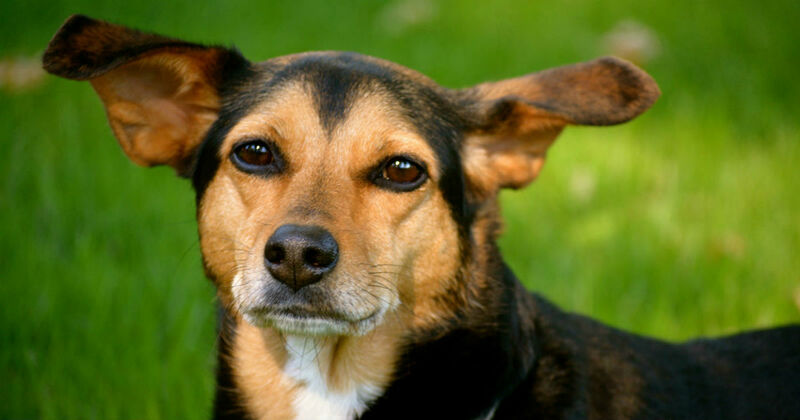 Have you found yourself curious about the beagle pinscher xix, also known as the “meagle,” “min pin beagle mix” and “mini pinscher beagle cross”? Are you wondering if the meagle would be the right addition to your household? Then you’ve come to the right place. In this article, we’ll go over everything you need to know about this proud, fun-loving and curious crossbreed, from his temperament, history and everything in between. But first, let’s briefly go over the details of crossbreeding and the controversy that goes along with it. A crossbreed, referred to by some as a “designer dog,” is the product of two separate purebred parents. The beagle and the pinscher, for example, are the parent dogs of the meagle. Crossbreeding has grown in popularity over the last decade or so, so the practice is still considered relatively new. As with anything new to the scene, there is some controversy when it comes to the concept of crossbreeding dogs. While some people prefer purebred dogs because of the certainty of physical characteristics and temperament, others point out that purebred dogs are more prone to generational health issues as a result of overbreeding. Many experts consider crossbreeding to be a solution to these generational health issues that have plagued purebreds for generations. However, naysayers still argue that genetic defects can be just as prevalent in crossbreed dogs, if not more prevalent. There are also some objections to crossbreeds and whether or not they are a breed in their own right, or if they are really just mutts. Supporters of crossbreeding insist that crossbreed dogs are the result of two purebred parents, while mutts have a lineage of several different breeds in their bloodline. Regardless of where you stand with the controversy, one thing is for certain: If you are considering adding a new dog to your household, it’s important to learn as much about your desired breed—or crossbreed—as possible. Because the meagle is a newer crossbreed, there is still very little known about his origin. Still, the histories of his two purebred parents are fascinating and will help to give us some insight as to what the beagle pinscher crossbreed is all about. Let’s begin with the beagle. Beagles are a part of the hound family, and they are considered one of the most popular hound breeds in the United States, according to AKC. Currently, the beagle sits at number five on the list of America’s most popular dog breeds. Primarily bred for hunting, the beagle is renowned for his keen sense of smell and signature bark, which comes in handy particularly when leading hunters through the woods to their fallen game. But what about the miniature pinscher? Is his history as exciting? Known as “King of the Toys,” historians believe that the proud min pin is a descendant of the dachshund and Italian greyhound. Although historical artifacts depicting the min pin suggest he is an extremely old breed, official documentation didn’t surface on him until about 200 years ago. For this reason, and much like his beagle counterpart, the majority of the miniature pinscher’s early origin is unknown. The miniature pincher is an extremely popular breed in Europe, and he was officially recognized by the American Kennel Club in 1925, where he sits at number 68 in popularity in the U.S.
As with any first-generation crossbreed, the outcome in regard to things like temperament can be unpredictable, as mixed dogs can inherit behavioral traits from either of their purebred parents. Taking a closer look at the parents of your potential beagle pinscher cross can help give you some insight into the possible temperament traits the meagle could inherit. We’ll begin with the beagle. In general, beagles are known to be playful, affectionate and highly energetic, meaning they will need consistent activity and a sufficient amount of exercise to stay happy and healthy. They also love the outdoors. Because of their intelligence and eagerness to please, beagles are easy to train and do well in homes with children. However, they are quite vocal and are known for their boisterous bark. What About the Min Pin? The miniature pinscher is a giant personality crammed into a teeny-weeny package. He is a proud dog, known for his playful, fearless nature. Because both the beagle and the min pin are playful and vocal dogs, a potential meagle owner can expect their crossbreed to be equally as playful and vocal. Proper exercise and plenty of toys can help to reduce noise and keep energy levels balanced, but be prepared to have a livelier, noisier household with a meagle around. Just like with temperament, the meagle mix can inherit a wide range of physical traits from both his purebred parents. Features like coat color, weight and height will be left up to chance depending on which parent the meagle takes after. An adult beagle will typically be 13-15 inches tall and will weigh about 20-30 pounds. The mini pinscher has a short, shiny coat with no undercoat. Historically for show, the pinscher was required to have his ears cropped, but that is no longer the AKC standard and these days pinschers often sport their natural ears. A full-grown min pin will be around 10-12.5 inches tall and weigh about 8-10 pounds. Considering the above information, a potential meagle owner can expect their meagle puppy to grow anywhere on the spectrum between the standards of the purebred beagle and the purebred miniature pinscher. For the most part, the meagle is easy to care for and only requires bathing a few times a month. However, both the pinscher and the beagle are seasonal shedders, so the meagle mix is going to require weekly brushing to help keep his coat shiny and healthy. The meagle will also need his nails trimmed regularly to avoid cracking or splitting, and his ears cleaned to avoid waxy buildup and infection. 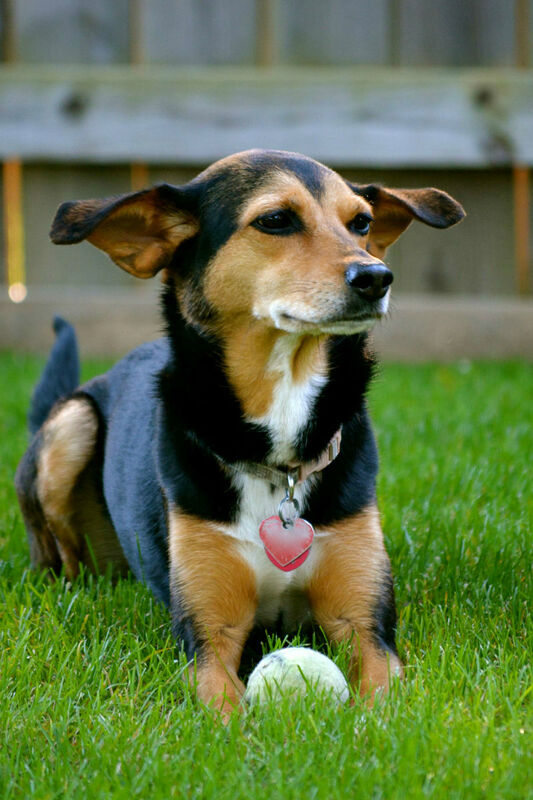 Considering the temperament of the beagle and the pinscher have some similarities, a prospective meagle owner can prepare for an intelligent, playful, curious crossbreed who enjoys using his voice. Like his parents, the meagle will be easy to train and will enjoy playing outdoors and going on adventures with his human counterpart. Whenever introducing a new dog to your household, we recommend proper socializing and training. This may include daily walks outside, visits to the local dog park, and trips to dog-friendly stores and shops to keep your meagle used to new faces, sounds and smells. Keep in mind that beagles in particular have been known to suffer separation anxiety and destructive behaviors when left alone too long. If they become bored, they will sometimes bark or even howl. Remember that because your meagle is a cross between the beagle and the min pin, your meagle could inherit any of the above traits predisposed to his purebred parents. Consistent exercise and a variety of toys can help keep your meagle calm and entertained while you are away. The meagle could have a lifespan of anywhere from 10-16 years, but it’s important to consider the lifespan and health issues that affect both his purebred parents. For the most part, the beagle is a healthy breed with a life expectancy of 10-15 years. However, there are some inheritable conditions to be aware of. These conditions include glaucoma, distichiasis, epilepsy, patellar luxation, central progressive retinal atrophy, hypothyroidism, cherry eye, keratoconjunctivitis sicca and chondrodysplasia. What About the Mini Pin? The miniature pincher has a lifespan of 12-16 years and can be predisposed to certain genetic health issues as well, including cervical disc, Legg-Clave-Perthes disease, patellar luxation, epilepsy, thyroid, heart defects and eye issues. Because so many health issues are inheritable, it’s important to research the history and parentage of your potential meagle cross whenever possible. Keep in mind that reputable breeders will be able to provide certificates regarding the health of the parent breeds, proving they have been screened and cleared of certain health defects. Early health screening in your meagle puppy can help you avoid or prepare for future problems, as many of the health issues he could encounter would be genetic. You can learn more about the health testing requirements as specified by the AKC for the min pin and the beagle here. While the miniature pinscher is a naturally slim and fit dog, the beagle can be prone to obesity and overeating. Since the beagle min pin cross could inherit this trait, it’s important to have a healthy feeding plan for your meagle. We recommend choosing a high-quality food brand as specified by your veterinarian that is suitable to your specific meagle’s size and weight. A proper diet and an adequate amount of exercise is the best way to avoid health issues related to obesity in your beagle pinscher crossbreed. Both the beagle and the pinscher enjoy play and adventure, so their meagle offspring will do best with an owner who partakes in an active lifestyle and enjoys being outdoors. The meagle makes an excellent family dog, but keep in mind he could be prone to howling and barking. Getting your meagle puppy from a reputable, responsible source is extremely important, so we recommend doing plenty of research before you adopt or buy from a breeder. Remember, shelters often carry crossbreeds, however, whether or not a meagle will be available in your local shelter at the time you are looking could be hit or miss. Still, one of the many advantages of rescuing from a shelter is the price. Although most shelters do incur fees, they are often a fraction of what many breeders charge. Prepare for adoption fees to be around $50-$100. Also keep in mind that most shelters cover initial vet fees, ensuring the dog is adoptable and ready for his new home. If you are looking to purchase a meagle cross from a breeder, be prepared to spend anywhere from $500 to over $1,000, depending on the breeder, the history of the purebred parents, and whether or not they are show quality. Whenever possible, ask your breeder about temperamental issues and health concerns with parent dogs or previous litters. Remember that reputable breeders will be able to provide certificates proving their dogs have been screened for health issues. As previously mentioned, early health screening can help you avoid or prepare for future health issues in your meagle crossbreed. If you are still unsure about rescuing from a local shelter or purchasing a dog from a breeder you found online, you can always attend local dog shows. Networking at events like this can help to point you in the right direction. You can also find a local AKC club, which can help you in your search for the right breeder.